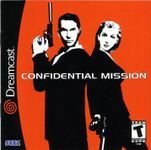 Originally an arcade game, then released for the Dreamcast, Confidential Mission is a light-gun shooter in the style of Virtua Cop but with with a James Bond inspired espionage setting/storyline. The game supports 1 or 2 players, who can use either the Dreamcast controller or a light-gun. The gameplay is a mixture of normal 'on rails' light gun gameplay mixed with 'quick time event' style mini-games breaking up the action. As the game arrived late in the Dreamcast's lifecycle, it never enjoyed a lot of popularity and hasn't been released on any other platforms.